Editor’s Note: BMW usually provides tons of technical detail on their motorcycles and accessories, and the following information is a lightly edited translation of a large document provided by the BMW press office. Since webBikeWorld visitors can’t seem to get enough when it comes to detailed information, read on! Entering its next generation, BMW Motorrad Integral ABS is taking a quantum leap in the process of evolution, advancing from a stand-alone solution acting only on the brakes into a fully networked all-round system. Offering the new generation of Integral ABS, BMW Motorrad provides the foundation for additional dynamic riding control systems with a reduction in technical requirements and features. And following the customer’s wishes, this new generation also opens up the option in future for further-reaching rider assistance functions. The first step in this direction is BMW Motorrad ASC Automatic Stability Control available as of 2007. This system serving to control drive spin on a production motorcycles is being introduced as an optional extra on the touring models in the BMW K and Boxer Series. Once again, therefore, BMW is acting as the pioneer in the introduction of advanced safety technologies on the motorcycle. This further enhances the leadership which BMW Motorrad has shown in the area of active safety for more than 15 years. Choosing the right development partner for both systems, BMW Motorrad obviously had to focus on that partner’s specific competence in control technology and the networking of functions within the vehicle. In recent years, major car suppliers have become aware of the technical challenges presented by the motorcycle with its specific riding dynamics and the growing potential for motorcycle control systems in the market. The decisive point in pre-selection of the development partner was the willingness and ability to develop specialized solutions suitable for use on BMW motorcycles. So taking this into account, joint development of the new generation of ABS brake technology started together with Continental-Teves in early 2003. BMW Motorrad’s new Integral ABS technology has been developed separately from the previous system and the entire layout of the system has been newly conceived from the ground up. Capitalizing on progress in technology in both hydraulics and electronics, the development engineers have succeeded in simplifying the architecture of the system while at the same time enhancing its functions to an even higher standard. The result is supreme stopping power and very short stopping distances even without electrical power assistance on the brakes. BMW Motorrad’s new Integral ABS is no longer based on the plunger principle or, respectively, the ram pressure process used on previous generations, but instead is conceived as a valve system. Carried over from automotive applications, this control concept is now able to ensure a very high standard of all-round comfort and convenience in every respect. In particular, feedback of brake pressure modulation on the brake lever has been reduced by recent development of the control valves and management to such an extent that it no longer has any kind of adverse effect, thus paving the way for introduction of the new system also in the topmost segment of BMW motorcycles. The new Integral ABS system applies brake pressure on the front wheel brake solely by means of a hydraulic circuit, thus acting entirely in response to the operating forces applied on the hand lever. This, in turn, ensures a more direct feeling of the brakes particularly important to the sports-minded rider. And now the rider no longer has to get used to any change in control or operation of the brakes when switching over from a motorcycle without ABS. The new system naturally maintains the proven semi-integral function, that is automatic activation of the rear-wheel brake when operating the front wheel brake. Pressing the foot brake alone, however, the rider, as in the case of a conventional system, activates only the wheel brake at the rear. As with the previous system, the advantages of this integral brake are ideal brake force distribution on both wheels under all conditions, naturally taking load conditions into account, as well as enhanced control enabling the rider to detect at an early point the risk of the rear wheel lifting off when applying the brakes all-out, and to take appropriate counter-action. To provide the desired integral function, brake pressure for the rear-wheel circuit is generated and built up by an electronically controlled hydraulic pump. This offers the advantage of pressure management and control completely independent of the front wheel circuit – which is the prerequisite for dynamic, adaptive and, ultimately, consistently ideal brake force distribution to the rear wheel as well as fully independent brake management and control. In the event of any deficiencies in the hydraulic pump or electrical components, the rear-wheel brake acts hydraulically as with a conventional system, overriding the integral function. This has no effect on the proper operation of the front-wheel brake, the only difference being that the ABS function is no longer operative in the event of such a deficiency. Acting together, these two functions enhance riding stability and thus help to ensure a higher standard of safety on the road. And last but not least, the rider is able to deactivate ASC at any time, also while riding. In its basic principles, the system and its various functions are quite straightforward: The ABS wheel sensors determine the speed at which the wheels are turning. Registering any sudden change in the difference in speed front-to-rear, the electronic control unit is able to detect any risk of the rear wheel spinning, engine management responding immediately by intervening in the ignition angle to take back engine power. Should this not be sufficient, that is should a greater reduction of engine power be required, fuel injection will be cancelled out for a certain time. This kind of control and management is fast and sensitive, with any effects on riding comfort and dynamics being virtually negligible. Looking back at a Pioneering Achievement. Motorcycle experts certainly waxed lyrical back then in spring 1988, expressing their admiration for a “revolution in technology” and “the most significant progress ever made in the area of active safety”. This was when BMW became the first motorcycle manufacturer in the world to introduce an electronic/hydraulic anti-lock brake system (ABS) in the BMW K100 motorcycle. Originally weighing in at 24.5 lbs. (11.1 kg), BMW Motorrad’s revolutionary ABS was a great success from the start, with some 70 per cent of all purchasers ordering their K100 with ABS as early as in 1989. And by the end of 1995, approximately 60,000 BMW motorcycles had been delivered to customers with the first generation of ABS technology. In its configuration and system structure, this motorcycle ABS was quite different from the systems used in the automobile: Anti-lock brakes in the automobile incorporated hydraulic valves with cycle management serving to modulate brake pressure – a principle inevitably subject to a certain degree of unwanted feedback. At the time, therefore, using the valve systems available back then, the pressure pulses generated during application of the brakes with ABS were clearly noticeable on the brake lever. This kind of feedback – or backlash, as one might also say – was regarded as unacceptable on the motorcycle, especially considering the wish to introduce the new technology on a broad scale. Indeed, movements of the brake pedal and unusual noises during application of the brakes with ABS had initially irritated customers right from the start when ABS technology was introduced for the first time in the passenger car. Precisely this is why BMW Motorrad, cooperating at the time with FAG Kugelfischer, developed a plunger system operating without the slightest feedback or backlash. In this case a plunger masterminds the volume of brake fluid and, accordingly, the pressure acting on the brake whenever ABS is active. The brake lever (that is the hand brake or foot brake lever) is hydraulically separated in the ABS mode by a mechanical ball valve thus avoiding any kind of pressure pulse the rider might feel on the lever. Positive response from customers confirmed from the start that this was the appropriate technical solution. The next generation of ABS brake technology, BMW Motorrad ABS II, entered the market relatively soon in 1993. This was at the same time as the first model in BMW Motorrad’s brand-new generation of four-valve Boxers, the R1100RS. This new generation of ABS was hardly more than half the weight at 13.14 lbs. (5.96 kg) of the first generation, and was far more compact in its dimensions. Reliability was enhanced to an even higher level through the use of electronic systems in modern digital technology. The most significant improvement, however, involved the control system, integrated travel measurement determining the appropriate travel of the plunger in the system during the first control cycles and thus providing optimum brake pressure after just a few cycles, with only minimum adjustment being required thereafter (unless the rider encountered a sudden change in frictional coefficient). In practice, this meant soft and smooth brake control up to the tires’ maximum level of friction, capitalizing on the motorcycle’s brake power. As a result of this superior technology, the number of BMW motorcycles equipped with ABS quickly rose to almost 90 per cent in Germany and an impressive 78 per cent on average for all markets. And by the year 2000, some 200,000 BMW customers the world over had opted for a motorcycle with ABS. The third generation of ABS brake technology, BMW Motorrad Integral ABS, was presented at the INTERMOT 2000 Motorcycle Show and entered the market in spring 2001. Once again, this was a revolutionary step into the future, with electrical brake power assistance being realized for the first time on a motorcycle. With operating forces reduced to a minimum, this new technology ensured maximum brake power and performance enabling even the inexperienced rider to shorten stopping distances to a minimum whenever required in an emergency. Further special features were the integral brake function connecting the front and rear wheel brake circuits. 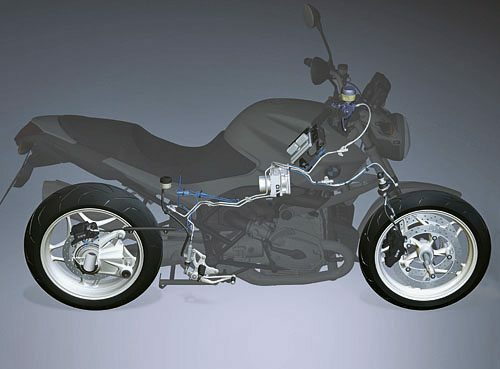 The overall configuration of the system with internal pressure sensors being used for the first time allowed load-related, adaptive distribution of brake forces on the two wheels of the motorcycle. Despite this enhanced range of functions, the system was once again lighter than before, weighing just 9.59 lbs. (4.35 kg), approximately 20 per cent less than ABS II. 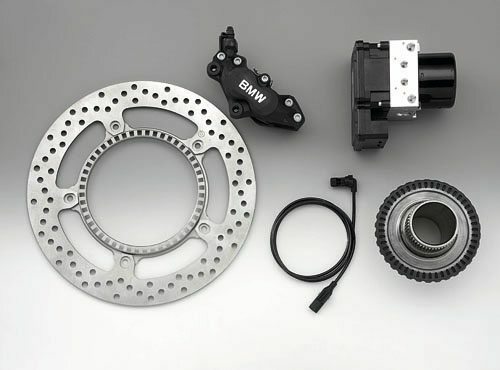 The third generation of ABS brake technology with integral control continued its outstanding story of success in BMW motorcycles: By the year 2005, more than 80 per cent of all BMW motorcycles were fitted with this revolutionary system, some models even exceeding the 90 per cent mark. In all, more than 280,000 BMW motorcycles featuring Integral ABS were delivered to customers by the end of 2005, the total number of all BMW motorcycles with ABS delivered to customers even exceeding the figure of 500,000 units by September 2003. ABS was also introduced as a standard feature on BMW Motorrad’s entry level F650GS in the year 2000. This is a BOSCH valve system without an integral function, since compact dimensions, very low weight, and an attractive price are the essential criteria for the lighter motorcycles in this segment. An enhanced system based on this technology was introduced in 2006 in the new F800 S/ST midrange models as well as the new R1200S Sports Boxer and weighs just 3.3 lbs. (1.5 kg). Introducing the new generation of ABS brake technology, BMW Motorrad is changing over to a new, even more advanced system featuring valve-based pressure control also on Integral ABS. Progress in hydraulics, in the area of control valve technology, and in electronics now allows the same comfortable operation of the system with minimum feedback as in the case of plunger systems or ram pressure concepts. In its fundamental configuration of brake hydraulics and valve management, BMW Motorrad’s new Integral ABS is comparable with other valve-controlled ABS systems. The special features of BMW’s system lie in the concept of pressure management, the use of intelligent control strategies, and in the integral function. The latter is a semi-integral system, meaning that whenever the rider applies the front-wheel brake by means of the hand brake lever, the brake circuit for the rear wheel is automatically also activated in the same process. The foot brake lever, on the other hand, acts solely on the rear wheel brake. BMW Motorrad’s new Integral ABS is being introduced step-by-step on all models in the new K and Boxer generation (with the exception of the BMW R 1200 S), replacing the previous system. Hydraulic and pressure control functions. The overall principle followed by BMW Motorrad’s new Integral ABS is relatively simple: Brake pressure generated manually by the rider via the brake lever and the main brake piston is transferred via an open valve (the intake valve) directly to the appropriate wheel brake. As soon as the wheel sensors and electronic management determine that a wheel is about to lock, the intake valve is closed and an outlet valve arranged in parallel in the wheel brake circuit is briefly opened. This allows brake fluid to flow through the outlet valve into a reservoir (low-pressure storage), very quickly reducing brake pressure on the appropriate wheel brake (if necessary down to zero). This operation of the valves is accompanied by activation of an electrically driven hydraulic pump delivering the brake fluid flowing out of the wheel brake circuit back into the control circuit and thus setting off the volume in the respective brake circuit. Then, once the wheel is able to turn again freely, the outlet valve is closed and the intake valve is opened, re-establishing the hydraulic connection between the brake lever and the main brake piston. Now brake pressure built up by the rider via the brake lever once again increases hydraulic pressure in the brake calipers. Appropriate control and operation of the valves, finally, serves to modulate brake pressure, adjusting the stopping forces acting on the wheel to the current frictional coefficient and road conditions. Analogue pressure management for fine-tuning system pressure. Modern hydraulic valves with an adjustable cross-section are featured on the intake side. Appropriately controlled and operated, they allow continuous, ongoing management of volume flow in building up pressure on the wheel, thus providing analogue-based pressure control of the brake. This ensures a significantly higher standard of control quality and precision over previous valve systems with a fixed, pre-set opening cross-section limiting their operation to simple “black-or-white” control when opening and closing. In conjunction with appropriate control strategies, BMW Motorrad’s new Integral ABS is able to build up pressure quickly during the control cycles and adjust system pressure with a high level of precision. This, in turn, reduces pressure pulses and, accordingly, any “kick-back” effect on the hand lever, making the entire control process smoother and more comfortable. Three additional pressure sensors in the system continuously monitor pressure conditions. With system pressure being masterminded and determined in this way, and with previous cycles being evaluated, the system is able to specifically control brake pressure as needed, setting pressure to the respective level required and thus reducing the number and intensity of control functions during operation of the brakes in the ABS mode. Provided there is no sudden change in frictional coefficient, only fine-tuning of brake pressure is then required after the first control cycles. This ensures smooth and comfortable application of the brakes with optimum stopping power close to the respective friction limit. And with modulation of brake pressure being relatively small, variations in wheel load and, accordingly, movements of the vehicle are kept to a minimum, enhancing riding stability and giving the rider an even better feeling of all-round safety. BMW Motorrad’s new Integral ABS no longer requires an electrical brake servo. Rather, recent developments in brake hydraulics ensure very rapid buildup of pressure and – just as important – virtually spontaneous reduction of pressure in the control phase. This ensures immediate reaction of the system under all conditions to the rider’s specific need for brake power as well as smooth and precise control by means of hydraulic operation alone. Wheel brake circuits separated completely from one another. The brake circuits for the front and rear wheel on BMW Motorrad Integral ABS are separated completely from one another, and are not linked by any kind of hydraulic connection. This ensures a clear and straightforward brake feeling at all times with a clearly defined pressure point particularly on the front-wheel brake under all conditions. Brake pressure on the front wheel is generated in the conventional process by the rider via the main brake piston in the control lever and acts directly on the front brake caliper. Wherever the ABS control function is required, the electronic control unit modulates brake pressure via the valves in the brake circuit, as described in the foregoing. The rear-wheel brake is also operated in the usual way by the rider pressing down the foot brake lever. As long as the rider presses down the foot brake lever only, the foot brake will generate the brake pressure desired in an all-mechanical/ hydraulic process, pressure acting on the rear-wheel brake only. Whenever necessary (that is with the wheel threatening to lock), brake pressure is controlled appropriately via the ABS valve system. Integral brake with electro-hydraulic pressure generation. To activate the integral function, brake pressure for the rear-brake is generated actively via an electro-hydraulic high-pressure pump as soon as the rider pulls the hand brake lever. The pump is switched on automatically every time the rider uses the front-wheel brake and is masterminded by the pressure sensors in the front-wheel brake circuit. Geared to brake pressure on the front wheel, appropriate pressure is built up automatically on the rear-brake in accordance with the brake force distribution predetermined by the control unit, the rear wheel thus being decelerated ideally with every application of the front-wheel brake (semi-integral function). Even when using the integral function, the rider has the option to brake the rear wheel harder via the foot brake lever than the integral system as such would allow. This he can do up to the rear wheel locking point where ABS cuts in. Should the brake pressure applied by the rider be weaker than the pressure generated via the integral function, the rider’s operation of the foot brake is not taken into account and the rear-wheel brake is applied in accordance with the integral function. Ideal brake force distribution between the front and rear wheel changes as a function of the load the motorcycle is carrying. The integral brake is also able to take load conditions into account by adjusting accordingly. Comparing wheel locking pressure in the wheel circuits, pressure measurement within the system provides an indication of the load the motorcycle is currently carrying and adjusts brake force distribution accordingly whenever the brakes are applied in the ABS mode. In all, electro-hydraulic generation of brake pressure for the integral function ensures perfect adjustment of rear-wheel brake pressure under all conditions as a function of front-wheel deceleration (ideal distribution), load conditions, and the frictional coefficient. Only this method of generating pressure is really able to give priority to the rider’s specific wishes and operation of the brakes, whenever appropriate. And should the hydraulic pump ever fail to operate, the parallel hydraulic circuit on the foot brake lever will act by itself, the rear-wheel brake operating in the same way as a conventional hydraulic brake. Semi-integral function for extra safety and stability. A point to be emphasized once again here, since it is often underestimated, is the advantage of the semi-integral brake concept with independent, optimum distribution of brake power on both wheels. When applying the brakes under “normal” conditions below the maximum limit of deceleration, that is in the most common situation in everyday traffic, the rear wheel is able to convey significant stopping power to the road. Since lateral guidance forces on the tire decrease as a function of increasing brake power, better distribution of brake power between the two wheels enhances both safety reserves and lateral stability. This advantage is particularly significant in braking maneuvers often forced upon the rider in a bend, where the degree of stopping power and deceleration required depends on the specific situation encountered by the rider. Should the rider apply the brakes in such a situation only on one wheel, the wheel involved (generally the front wheel) has to convey the full power of the brake and is therefore only able to build up a low level of lateral support and guidance. 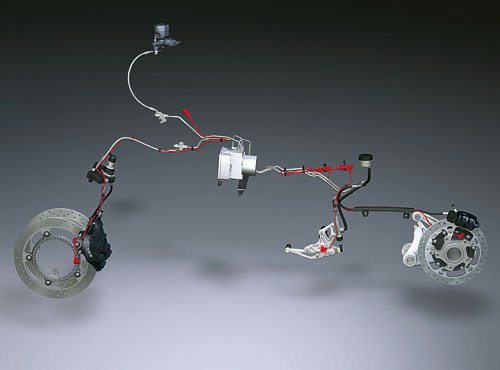 The integral system, by contrast, distributes brake power ideally to both wheels, providing a higher level of lateral and side support on each wheel (naturally as long as the brakes do not enter the ABS mode). This ensures maximum brake stability within the physical limits applicable in each case. Apart from increasing side forces, the semi-integral function also ensures better detection of a rear wheel lifting off when applying the brakes all out. While conventional two-channel ABS brake systems are only able to evaluate wheel speed signals, BMW Motorrad’s integral system provides more information, monitoring both pressure signals in the two brake circuits and the speed of both wheels and thus determining the degree of stopping power and, accordingly, any tendency of the rear wheel to lift off. The system is therefore able to effectively counteract such behavior in good time by specifically reducing brake pressure on the front wheel in the interest of enhanced riding stability and maximum stopping power. And a further advantage is that the system actively detects current riding conditions, thus also taking the load the motorcycle is currently carrying into account. Compact and light pressure modulator serving as the heart of the system. All function units of BMW Motorrad Integral ABS are housed within the pressure modulator. This compact control system accommodates the control valves, pressure sensors and hydraulic pumps including their electric motor, as well as the electronic management system. The pressure modulator is therefore quite literally the “heart” of BMW Motorrad’s Integral Brake System. Nevertheless, the entire unit weighs just 5.1 lbs. (2.3 kg) and is therefore approximately 50 per cent lighter than the former system. BMW Motorrad’s new Integral ABS also benefits from full diagnostic control: all functions and sensors are permanently monitored by the system’s electronic “brain”. Compared to the former system, the duration of the initialization phase after switching on the ignition is now far shorter. Malfunctions, should they occur at all, are saved in a non-volatile memory and may be subsequently read out in the workshop. Should the electrical or electronic components suffer a deficiency, in turn, the control valves are moved mechanically (by springs) to their basic setting, thus always maintaining a direct hydraulic connection between the brake controls and the brake calipers, as in the case of a conventional brake system without ABS. Under such circumstances the brakes will operate as usual in terms of brake power and application, only ABS control and, where applicable, the integral function no longer being available. Deactivation of ABS for off-road use. On the R1200GS and R1200GS Adventure, the rider once again has the option to deactivate BMW Motorrad’s new Integral ABS for off-road use. Even when ABS is deactivated, however, the system maintains its integral function, which may often prove very helpful when riding off-road. 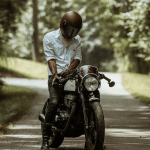 To hold the motorcycle in position on a slope with loose ground beneath, for example, all the rider has to do with Integral ABS is pull the hand brake lever. This will apply the brake on the rear wheel with a good and strong effect, keeping the motorcycle safely in position and preventing it from slipping back. Setting off in such a situation is also facilitated by the system, since the rider no longer needs his foot to apply the brakes and is therefore able, whenever necessary, to use both feet for extra support on the ground. ASC (Automatic Stability Control) limits and controls spin on the rear drive wheel. It therefore prevents the rear wheel from spinning out of control under acceleration on slippery surfaces and helps to avoid a possible loss of lateral stability. Acting as the logical counterpart to ABS, ASC is the first step towards enhanced rider assistance systems controlling riding dynamics on the motorcycle. Currently BMW is the only motorcycle manufacturer in the world to offer traction support as an option on series production motorcycles: Upon the introduction of ASC in 2007, customers will be able to order this revolutionary new system for all Boxer models with the exception of the R1200S Sports Boxer and the K1200GT. ASC is available only in combination with Integral ABS (while ABS without ASC is naturally still available as before). ASC assists the rider when accelerating on difficult and slippery surfaces, and offers extra safety particularly on rapidly changing road surfaces difficult to assess in terms of surface grip and friction. It is not conceived, however, for maximum acceleration or for accelerating all-out while leaning over sharply, for example in a bend. Within the usual limits of physics, however, Automatic Stability Control is able to reduce any side swerve effect of the rear wheel also in a bend, thus helping to enhance the motorcycle’s riding stability. But it is important to note that ASC cannot enhance the natural, physical limits to the stability of a single-track vehicle, and that it does not relieve the rider from the need to use engine power appropriately when leaning over to a low angle. An additional function of ASC is that it prevents the front wheel from lifting off when accelerating under full power – again an important contribution in the interest of extra safety. Function and control. ASC uses the ABS wheel sensors to monitor the speed at which the wheels are turning and also applies the diagnostic functions offered by these sensors. Wheel spin, in turn, is determined by the engine’s electronic “brain” comparing the speed of the front and rear wheels. Should the system detect any tendency of the rear wheel to spin, electronic engine management will intervene accordingly, setting drive forces to the limit the tire is still able to convey. The first step in this process is to reduce torque by adjusting the ignition angle (or, to be more specific, by retarding the ignition timing point). Should a greater reduction of engine power be appropriate, fuel injection will be stopped for a certain period. An advantage of this control function is that it is quick and sensitive, with hardly any impairment of riding comfort and dynamic performance. The rider is informed of the function when active by a telltale flashing on and off quickly in the control panel. And if the rider does not wish to use ASC, he is able to deactivate the system at any time, also while riding, simply by pressing a control button. Additional off-road set-up for the GS models. An additional off-road set-up has been developed and memorized within the control system for off-road use of the R1200GS and R1200GS Adventure. This special off-road mode takes wheel slip and spin conditions on loose surfaces into account, allowing a higher level of spin under such circumstances. Pressing the ASC button, the rider is able to switch over from the road to the off-road mode and vice versa. It is important to note that the off-road setup is not suitable for road use. Supreme functional safety and reliability through integration of control systems. ASC Automatic Stability Control has been developed together with BMW Motorrad’s new Integral ABS and the ASC software programmed as part of the overall engine control electronics. This saves the need for a separate ASC control unit, reducing weight and space requirements accordingly. Full integration of the system also saves the need for additional connections in the interest of enhanced safety and minimum risk of interference. Like all electronic control functions, ASC also features self-diagnosis and a defect memory for reading out information when the motorcycle is serviced. And should, finally, ASC not be available, the rider is informed accordingly by the telltale on the control panel.